Visual learner? Watch me make this Southern Butter Pound Cake from start to finish! Pound cakes are my true love! Like seriously they speak to my heart and soul. Butter pound cakes instantly remind me of childhood summers at my great grandfather’s house in Elberton, GA. The slam of that screen door, the sound of nothing but buzzing insects and bubbling creeks and catching lightning bugs at dawn! Ahhhhh memories! Butter pound cakes were always present at his home. 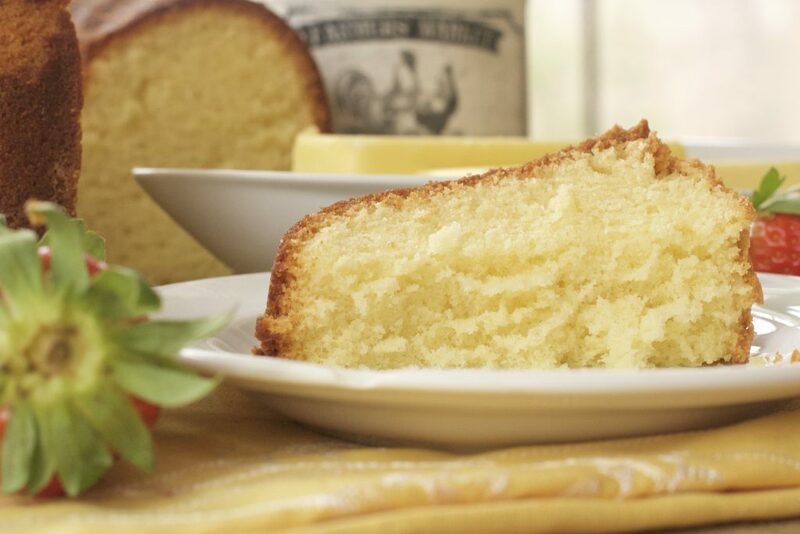 It’s true; you just can’t go wrong with a good, old-fashioned butter pound cake! Whether you are topping it with fresh fruit like peaches or strawberries or just eating it as is, it’s just a Southern classic! 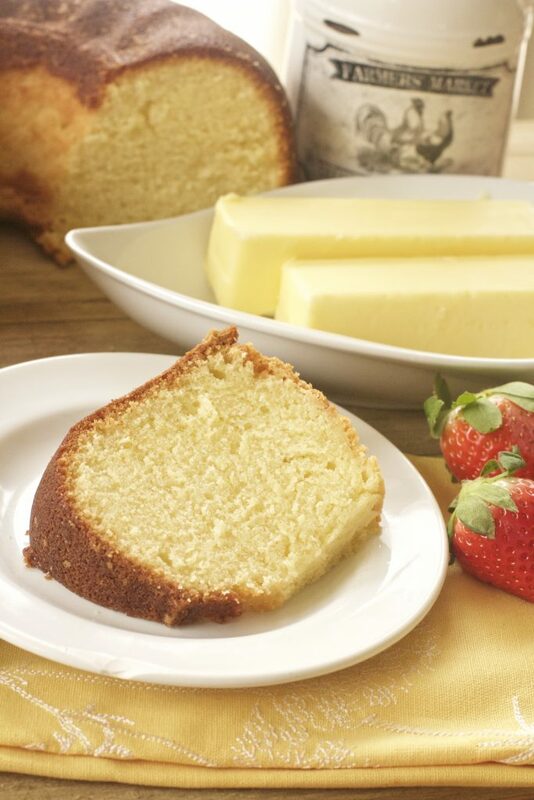 Butter pound cakes are pretty darn simple and a lot like a vanilla pound cake, only with more buttery flavor! To bump up that buttery flavor and create a delicate crumb, I’m using butter-flavored shortening. If you can’t get your hands on buttered flavored shortening, then regular shortening with a bit of butter flavoring will work just fine! 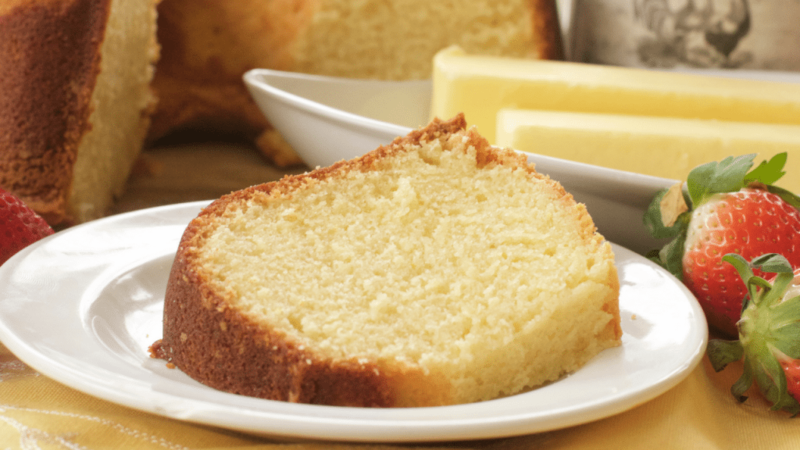 The texture of this butter pound cake is just perfect! The crumb is so fluffy and moist. It only gets better the next day, and it freezes like a dream! At the end of the video, I show you how I like to freeze my pound cakes. Pound cakes are some of the BEST cakes to freeze because once thawed, they come back to that amazing crumb texture & flavor as if it’s freshly baked! You can ALWAYS find frozen pound cake in my freezer. It’s great for last minute guests! There is nothing like ending a spring/summer dinner with warm pound cake topped with grilled pineapples or freshly picked strawberries & whipped cream! Especially if you can just grab the cake from the freezer and thaw! To freeze my pound cake I cut the cake into slices. Then I wrap each slice tightly with plastic wrap. Next, I wrap them in foil paper and place the slices in a freezer container. Now, this might seem like overkill but I even taste a hint of “freezer” on my food, I can’t eat it. This method keeps pound cake fresh and protected for up to 4 months! Cake thaw really fast so I just place it on the counter and let it thaw out. Grease and flour a bundt pan. Set aside. In a large bowl whisk together flour, baking powder, and salt. Set aside. In a large bowl cream together butter, shortening, and sugar. Mix in eggs, one at a time, mixing thoroughly after each egg. Add dry ingredients into wet ingredients, alternating with the milk and buttermilk. Mix until batter is fluffy. Spoon batter into prepared pan and shake the pan to even out the top and release any air bubbles. Remove from oven and let the cake sit in the pan for about 10 minutes. Then remove from pan and place on a cooling rack to finish cooling. Sooo I baked this cake. Now I have to bake 6 for6 different households because the caje was Delicious. And quite is kept. It was the easiest pound cake I’ve ever baked. I just folled the recipe and it came out perfect. Now I would like to try another one of your cake recipes. What would you suggest? Thank you for a DELICIOUS POUND CAKE. Good Morning Monique I used a lot of your recipes and I love them all especially that red velvet cake is the bomb, Thanks for sharing your recipes with us and may God Continue To Bless You!!!!! O my god great recipes, you néed one for marble pound cake. I Used them all the tlme they are sogreat. This Pound Cake gave me life!!!! I’ve finally found a recipe that has worked for me. I found a vintage cake pan at the Goodwill and hunni this recipe and my pan together was a hit!!!! Thanks Diva! Can you use cake flour instead of regular flour? If so do I still have to add the baking powder in the cake flour? Thank you! Yes you can! The texture will be a bit lighter though, and yes you will still need the bp. Good morning Monique I wanted to ask can you use cake flour with this recipe as well and if so do I still need to use baking powder with the cake flour? Can you post videos and recipes for loaf cakes.